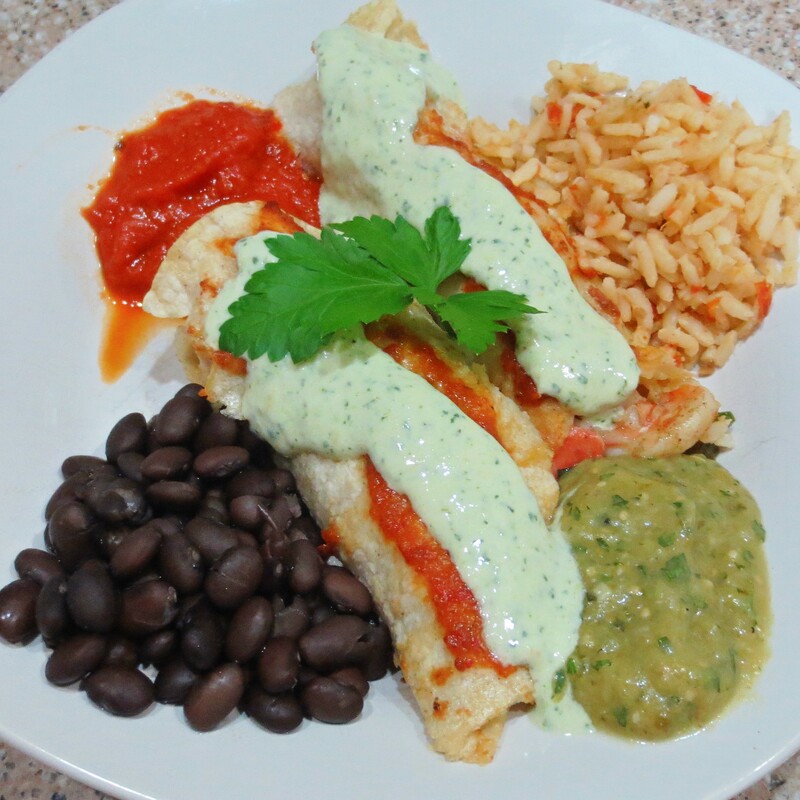 I originally intended these Seafood Enchiladas to be made with lobster and shrimp, but by the time lobster tails went on sale the store was sold out. I already had my sauces made, so I substituted imitation crab. The results were delicious! 1. In a large, heavy skillet over medium high heat, melt together the butter and oil. 2. Saute the peppers until they begin to caramelize on the edges. With a slotted spoon, remove the peppers to a plate and set aside. 3. Lower the heat to medium low and cook the shrimp just until they turn pink and begin to curl. 4. Turn off the heat and add the crab to the pan, then return the peppers and stir to combine. 5. Preheat the oven to 325° and spray or butter a baking dish. 6. Divide the shrimp mixture evenly between the tortillas and roll into enchiladas. Place them seam side down in the baking dish. 7. Spoon some of the Rojo sauce onto each enchilada. 8. Cover the dish with foil and bake 15 minutes, or just until hot. Do not over-bake. 9. Spoon some of the Cilantro Chile Cream over each enchilada and serve with Roasted Tomatillo Salsa on the side.